Being only 15km south of Calais, you can be teeing off at Ruminghem only 30 minutes after crossing the channel. 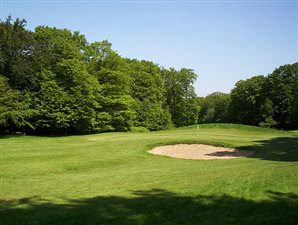 The 18 hole golf course of Golf du Bois de Ruminghem, designed by Bill Baker, is set between the forest of Eperlecques and the woods of Ruminghem. The relatively flat parkland front nine gives way to a back nine which is woodland golf at its best, utterly secluded and the peace disturbed only by the birdsong. An excellent challenge for golfers of all ability.